First, a very important disclosure: The Rollermouse reviewed here was sent to me by Contour Designs as a “review unit”, after they read my enthusiastic review of the previous generation Rollermouse. They made no demands regarding the content or tone of the review I wrote, and, luckily, I actually liked the mouse, so it didn’t come up. So, although I’ve tried to approach this objectively and honestly, caveat lector. A Rollermouse is an odd-yet-wonderful device. It’s a mouse which moves a cursor around your screen which you control by moving a hollow tube around on a metal bar. If you want the cursor to move up, you rotate the tube away from you, and down goes the opposite. If you want it to move side-to-side, you move the tube side-to-side on the bar. If you want to click, you can push down on the bar, or use a physical button. It’s ambidextrous, can work with any surface of your hand, and can be operated rather effectively with your hands still on the keyboard. They’re odd, they’re expensive, they’re not well suited to FPS gaming, and they’re confusing for the first 30 seconds of any new user’s life. But after those 30 seconds, they’re awesome. At this point, I swear by my Rollermouse Free 2. 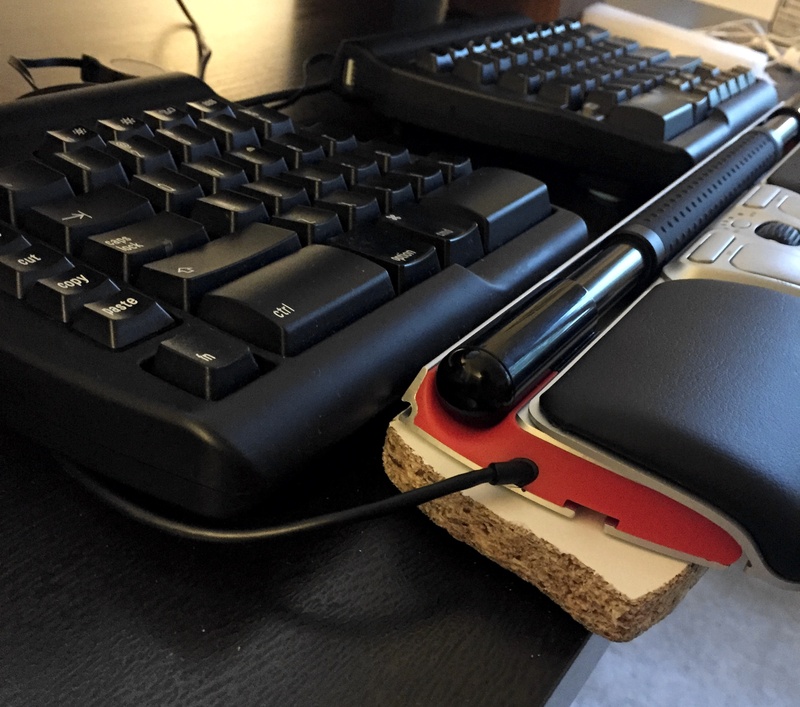 Every time I’ve tried something else for mousing, my wrists have rather loudly objected, and several keyboards have been returned because they haven’t played nicely with it. But, the Free2 is not without it’s faults. It has a nasty habit of freezing up when subjected to static shock. The bar gets grimy and unpleasant. You spend altogether too much time waiting for the cursor to catch up to the side of the screen on a widescreen monitor. The Copy and Paste buttons don’t work on a Mac. So, although it’s better for my body than any mouse I’ve used, it still had room to grow. Today, we’re going to talk about its evolution, the Rollermouse Red. This is Contour Designs’ new flagship Rollermouse, and they graciously sent me one to review. So, review it I shall, with a nod to Ars Technica’s Good, Bad and Ugly review style. The first good thing to note is that unlike many manufacturers who can’t leave well-enough alone, they haven’t screwed up what made the Free2 great. The adjustment period was around an hour, and after that, I like it as much as I liked the Free2, and more. No glaring design faults were introduced, there are no “Well, if only they hadn’t…” thoughts, and as near as I can tell, there’s no reason (aside from cost) not to buy the Red if you’re in the Rollermouse market. But a few new niceties jump out. First, it’s thicker, and this is a good thing. The Free2 is thin enough that most keyboards tower above it, and the Red is just a bit thicker. This means that, for instance, the Kinesis FreeStyle 1 would be just the right height, and with the FreeStyle II, wrist posture would be nice and neutral. They’ve also released a “Plus” size model which has a longer palm support, for those who use the device deeper on their desk. As I’m very firmly an edge-of-the-desk guy, this wasn’t needed, but for some, I imagine it’d be pleasant. Second, it’s smoother. The bar is now plastic, or carbon-fiber, or something, and is now completely dry. The tube, which is thicker, and nicely textured, now slides even more nicely over the bar than my old Free2. The click mechanism is smooth, the scroll wheel is smoother, and the whole device just feels smoother under the hand, particularly when at the edge of a desk (as the rounded edge of the Free2 was a bit sharp when hanging off). The Red is also more Mac friendly. Their little “getting started” guide allows the Copy and Paste buttons to work like a charm on a Mac, which is pleasant, and I’m hoping desperately that my muscle memory will realize that someday. There’s also now an option to use the (long-neglected) “Double Click” button for the middle mouse button, to open new tabs while browsing. Perhaps most impressive is that it handles edge-detection better than the Free2. On the Free2, if you ran out of rod before you hit the side of the screen, you’d use the sliding tube to press a button of sorts at the edge of the rod, which moved the mouse quickly to that side. The Red uses some other mechanism entirely, doing away with these buttons entirely. Yet, it’s done so transparently that I didn’t even notice that change until I sat down to write this review. It’s a very small change, but it’s also very nice. Finally, the build quality is great. It’s stiffer than the Free2, the wrist rest is comfier to rest your hands on while typing, and the whole thing just feels better designed. On the Free2, if all the feet weren’t perfectly on the level, the mouse would tend to click itself when you put weight on the wrist rest. This has been fixed with the thick-feeling aluminum base on the Red. And, although it’s completely meaningless, the box was really nice, and clearly, somebody in their packaging department has opened a lot of Apple Products. Although the susceptibility to gunk remains to be seen, and I now live in a state humid enough that I’ve forgotten what “static electricity” means, it appears that they’ve basically made an improved version of the Free2, which fixes a few small issues, and raises the bar in places where it wasn’t even lacking. However, this doesn’t mean that this is the perfect mouse. The Rollermouse Red’s biggest problems are, sadly, all inherited from the Free2. I had very much hoped that the Red would include screw-in feet or lifters, or something to raise or adjust the height of the mouse relative to the keyboard, but sadly, like with the Free2, no such method is included, and before you know it, you’re attacking an old shelf with a hand saw on your apartment’s deck, and sticking the whole affair together with foam tape. My second biggest gripe, again inherited from the Free2, is the lack of a dual-axis scroll wheel. 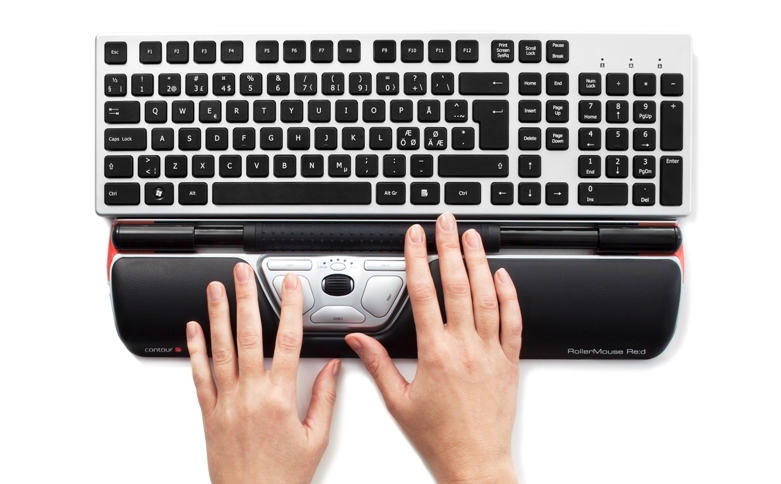 Most mice these days offer some method of horizontal scrolling, and the fact that a Rollermouse, which is effectively the world’s largest 2-axis scroll wheel, lacks the ability to scroll on two axes is frustrating, bordering on silly. Even something as simple as “Hold this button and move the bar to scroll” would be a revelation, but alas, no. They offer some workarounds if you install their drivers, and you can always hold shift while scrolling vertically with the built in wheel, but this is one of few modern mice lacking this feature. It’s still not going to work for Call of Duty, or any other game which depends on twitchy, speedy rotation around you. It’s great for Diablo, or Planetary Annihilation, or other games requiring speedy and accurate clicking, but if you need to make quick and large mouse gestures, no Rollermouse, Red or otherwise, will do the trick. And, there are a few other minor annoyances. The USB cable is permanently attached to the unit (rather than using something like a Micro-USB plug), making cleaning difficult with cable routing. There’s still no easy way to securely mount it to the edge of a desk, leaving you in the land of foam tape. And like the Free2 before it, the Red is just full of nooks and crannies for dust and desk-gunk. Keep your canned-air close, and your cookies distant, because those beautifully sculptured contours are going to catch some crumbs. Finally, we arrive at the ugly part: The Rollermouse Red costs $265. This is a mouse which costs more than decent laptop. This is a mouse whose price could buy my favorite keyboard ever and a very nice gaming mouse on top. The price is the only intractable problem with the Rollermice, and is the sole reason I’m not giving them to friends and family for Christmas. Yet, for me, it’s completely worth it. If somebody broke into my house (and now, my office) and stole my Rollermouse, I’d be on the phone with Contour Design the next day, angrily ordering a new one. This is truly the best mouse I’ve ever used, and given that I use a mouse, now pain free, for 5-8 hours each day, where only a few hours with a conventional mouse is a pain-fest, the price is well spent for me. But for you, it might not be. If you’re just looking at new mice, and you have no wrist pain or ergonomic woes, well, this is a great mouse. It’s accurate, it’s quick, and it’s unusual. It’ll keep your coworkers guessing, and you’ll be wrist pain free. But, you’ll lose choices for keyboards, your desk layout will follow the whims of your mouse, and you just spent $265 on a way to move an arrow across the screen. So, if you don’t play twitchy FPS games, you don’t scroll horizontally for a living, your keyboard is thin-ish, and you’ve got $265 to spend, do the 30 day trial. If you fall in love, great. If you don’t, nothing lost. If you’re in pain from conventional mousing, and looking for ergonomic choices, try your options. Try a trackball. Try a fancy ergonomic mouse. Try a stylus and tablet, if you’d like. But at the end of it all, if you’re like me, you’ll just get out the damned credit card and buy the damned Rollermouse. This is a lot of money, but for me, it’s saved me from a lot of pain. And if you’re buying your first Rollermouse, buy the Red. It’s absolutely $30 nicer than the Free2, and you’d as might as well go big. If you’re a Rollermouse Free2 user, or you’re trying to compare the Rollermouse Red vs. the Free2, the big question is whether it’s worthwhile to upgrade to the Red. The Red is nicer in pretty much every way while still acting pretty much identically, so if you love the Free2, I can pretty much guarantee you’ll love the Red. If you’ve been looking at getting a second Rollermouse, for work or something, then definitely upgrade. But, if you’ve already got a Free2 on your desk, I’m not sure that the Red is worth laying out $265 more, as you’ve already got 90% of the awesome right there in front of you. If you’ve got the cash, it’s a great upgrade, and I most certainly miss the Red when I’m using the Free2 at work. But if the upgrade price is a bit rich for your blood, given that the “Free” became the “Free2”, you can always just wait for the Red21. So, wrapping up, the Rollermouse Red is awesome. It’s an even better version of the Free2, fixing some of the annoyances, without adding new ones. It’s a great mouse, it’s an incredible ergonomic mouse, and it’s an excellent upgrade from the prior models. As far as I’m concerned, it’s the best ergonomic mouse money can buy. Your body may vary, but if you’re hurting, give it a try.